MANCHESTER, N.H. – The voting record of Republican Senator Kelly Ayotte has drawn the ire of New Hampshire retirees. 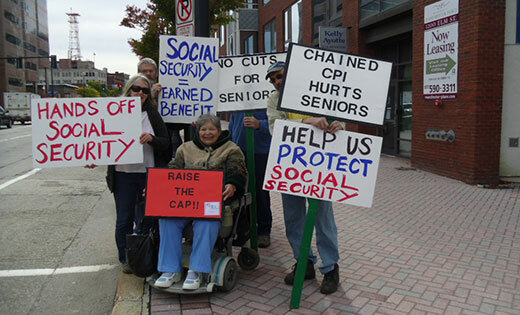 Unable to secure an appointment with her, they are picketing her Manchester and Nashua offices to raise their demand for improvements, not cuts, to Social Security. The retiree members of the New Hampshire Alliance for Retired Americans (NH ARA) have been requesting to meet with Ayotte since the summer of 2013. Initially this seemed like an easy ask. Considering that the U. S. Senate designates multiple days for travel, in-district workshops, holiday and summer recess, the NH ARA members thought their request was reasonable. Top that off with the fact that Ayotte holds a post on the prestigious U.S. Special Committee on Aging, and NH ARA represents over 13.000 retirees – a meeting just makes good sense. After all, wouldn’t this type of meeting help her to better understand her constituency? But stopping by her office, calling for an appointment, speaking with staff, requesting a meeting through mutual acquaintances and showing up at town hall meetings did not work. Even holding signs in front of the Senator’s Manchester and Nashua offices in the summer heat and the winter cold and snow has not resulted in a meeting. Ayotte apparently does not want to be held accountable for her votes on 49 health care related bills, most of which have to do with the Patient Protection and Affordable Care Act. The bills range from anti-choice measures, delaying portions of enacting the Affordable Care Act, and wiping out the law in whole or in part. Ayotte is a co-sponsor of S. 1711 the State Health Care Choice Act which allows states to opt-out and limit required coverage. The NH ARA wants to know why. Does Ayotte want to reopen the dreaded donut hole that caused financial hardship to seniors and other Medicare recipients that rely on expensive prescription medications? 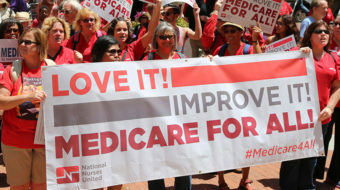 Perhaps she is not in favor of the clause that prevents insurance companies from arbitrarily canceling a customer’s policy when the customer becomes ill, or maybe it is the free preventative care wellness doctor appointments that she objects to. The NH ARA is left guessing if Senator Ayotte would deny our grandchildren the right to remain on their parents health plan until they turn 26 years of age or perhaps the lifetime and yearly coverage limits that the insurance companies were allowed to impose prior to the Affordable Care Act? Maybe Ayotte objects to holding insurance companies accountable to their customers by proving 80% of the premium paid is used for the purpose of insurance and that only 20% of the premium is allowable for CEO pay and profits. Considering her unwillingness to meet with the NH ARA, they may never know. The retirees also want to learn how their Senator justifies raising the eligibility age for full retirement Social Security benefits, and why she hasn’t signed on to S 567. 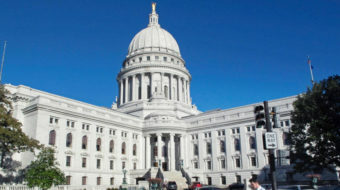 This bill would establish a price index that reflects actual costs of items for Social Security recipients and insures Cost of Living increases keep pace with inflation. The occasional town hall meetings hosted by Ayotte are well scripted and controlled. She makes a slide show presentation and only takes questions that are pre-printed on index cards prior to the start of the meeting. Latecomers are not allowed access to a card. The NH ARA monitors legislation. These retirees have ideas and questions and remain hopeful that one of these days, Senator Ayotte will meet with them. In the meantime, they continue to show up with signs and keep asking for a meeting with the senator at one of her many New Hampshire locations. Ayotte is not up for re-election in 2014. New Hampshire’s Democratic senior senator, Jeanne Shaheen, is one of the 36 senators up for election this year. Shaheen’s race is one of the top targets by the Republican Party. They want to grab control of the U. S. Senate and impose Ayotte’s agenda on our nation’s retirees and people. New Hampshire retirees already have their walking shoes ready to make sure this does not happen.